I really wanted to like this novel. There is a kernel of a good story here, but this story is an example of why a good editor is needed to make a successful novel. The book purportedly is about manipulation by the military of religious perceptions, and this is actually quite an interesting idea. The military uses high-tech holograms to create religious visions aimed at preparing the population for a feared alien invasion. And this is where the story should have focussed. Instead, the story takes in a huge cast of characters, many contributing absolutely nothing to the plot. The storyline plods on and on, taking side-trips to who knows where, yet when it is all supposed to be pulled together to a climax, it compresses this into a very short, unsatisfying ending. This “over-specification” pops up time and time again with both people and places. In the story “North Mexico” is the 51st state of the US, as is described the first time it pops up in the narrative. However, each and every time after that, is it always referred to as “North Mexico, the 51st state of the United States.” One character even uses the exact phrasing when speaking to a politician from North Mexico, as if she might have forgotten that the state was now part of the US. Later on, the author seems to forget about North Mexico and writes that El Paso is on the Mexican border, which it is now, of course, but would not be if there was a state of North Mexico. An important locale in the story is in a “space hotel,” a hotel which perches on an elevator 35,000 miles long and is secretly used by the military from which to beam their holograms. This makes absolutely no sense. A 35,000 mile elevator supporting a hotel in space would be totally unfeasible. First, why? The International Space Station is in orbit from 150-250 miles above the surface of the earth. So what possible advantage could come from making the hotel at 35,000 miles? The cost alone for the elevator would be more than for the construction of every skyscraper on earth. And all for a hotel? Then there are the descriptions of the “dangers” of the South American jungles. In her narrative, the author has an army of jaguars, maned wolves, and others creating such a danger that humans cannot be out at night without a severe risk of getting killed. Pretty much none of that is accurate. Jaguars need huge swaths of land as their territory, and to see even one is amazing. Attacks on humans are extremely rare. Maned wolves do not even live in the jungle, and they are extremely shy animals. While is it easy to get poked, bitten, stung, and whatever in the Brazilian jungle, and it is possible to catch a deadly disease, getting violently killed is quite hard to do. The holograms also seemed to be able to have physical effects. A hologram of Anubis was able to shake parts of walls and ceilings down. They also seemed to be able to kill. These are just a few examples of inconsistencies and downright errors. Some are fleeting and barely register, others are more jarring and interrupt the reading. Despite the above comments, there really is a story here. All the author needs is a good editor to help her form and shape the book, to help her with the inaccuracies. The author’s descriptive skills are quite good. She can paint a precise and clear picture of what she is describing. And the core premise of the book is fascinating and can be given an interesting treatment. 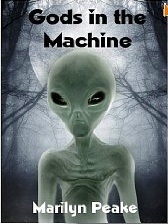 For more reviews or to buy Gods in the Machine from Amazon.com, click here.